There are two known populations of Siberian cranes today: An eastern population and a western population. The eastern population breeds in north-east of Siberia and spends the winter season around the Yangtze River in China, whereas the western population breeds around Ob River located east of Ural Mountains in Russia and winters along Caspian Sea in Iran. Cranes are one of the most handsome avifaunal creatures on Earth. Cranes belong to order Gruiformes and family Gruidae. There are altogether 15 species on the planet found on five of the seven continents. Antarctica and South America are devoid of any crane species. A critically endangered species, Siberian cranes, are the ones which cover the longest migratory distances, among all the different species of cranes. An adult individual is devoid of feathers on its fore-crown, face and side of head, which bear red colour. The bill is dark, long and pointed. The eyes are reddish and the legs are pinkish in colour. A central population of Siberian cranes was also known earlier which used to breed in Western Siberia and later visited India to spend the harsh winter months. In India, these birds used to winter, primarily, in and around the marshy areas of Keoladeo National Park (KNP), situated in Bharatpur district of Rajasthan. The selection of KNP in India for wintering by Siberian cranes was attributed to the wide availability of plants such as Cyperus rotundus, Scirpus tuberosus, Eleocharis dulcis, Nymphaea spp., and Scirpus littoralis in these marshy lands. During their stay at KNP, these birds feed mainly on tubers and rhizomes of these plants. However, there was a drastic decline in the number of Siberian cranes visiting KNP over the years. From 200 birds in 1964, their numbers crashed to 100 in 1967. In 1993 only five birds were sighted and none in 1994 and 1995. In 1996, there was a kind of re- appearance, as four visitors were reportedly sighted. 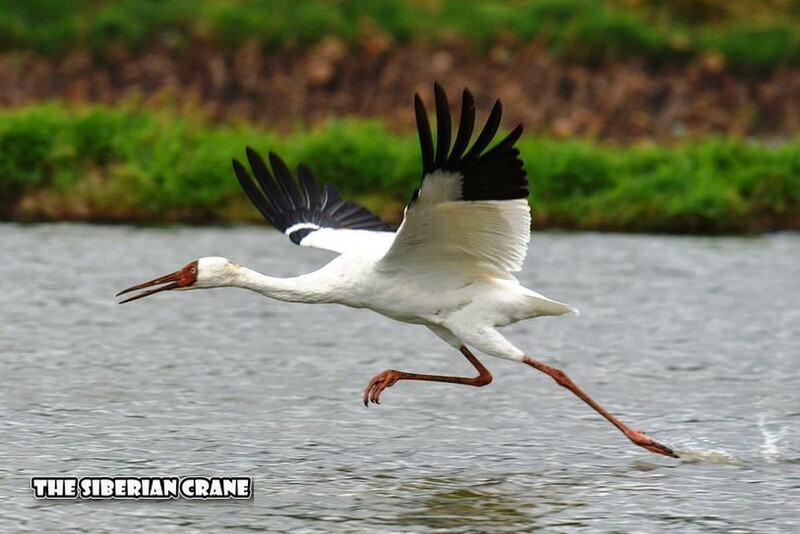 As per the information available from International Crane Foundation, the last documented sighting of Siberian Crane in India was way back in 2002. Siberian cranes are most habitat-specific, among the crane species. They completely depend on wetlands for different stages of their life. Habitat degradation, therefore, is considered as one of the prime reasons for their decline worldwide. Hunting of these birds during their arduous migratory journey is also believed to be contributing substantially to their decline. The 5,000 km (approx.) journey of the central flock of Siberian cranes starts from wetlands of Kunowat river in western Siberia and continuing over the Russian Federation, Kazakhastan, Uzbekistan, Turkmenistan, Afghanistan and Pakistan, finally terminates at KNP, in Bharatpur, Rajasthan. Throughout their migratory route, they are except in India where wildlife has a better protection. Besides the above mentioned two factors, infection due to a virus known as HPAI (highly pathogenic avian influenza) is also considered to be a potential threat to Siberian cranes. Conservation efforts Conservation efforts to protect Siberian cranes worldwide broadly involve two strategies: To save the extant eastern and western populations and to revive the central population. International Crane Foundation (ICF) is one of the major organisations working globally towards conservation and protection of critically endangered Siberian cranes. ICF initiated Siberian Crane Wetland Project (SCWP) with grants from Global Environmental Facility (GEF) in 2003. SCWP was carried out in collaboration with UNEP (United Nations Environmental Programme), CMS (Convention on Migratory Species) and the governments of People’s Republic of China, Islamic Republic of Iran, Republic of Kazakhstan, and Russian Federation. Attempts have also been made to artificially re-introduce captive-bred Siberian chicks into the central population, though with little success so far. The success of conservation efforts depend upon three factors: complete ban on hunting along the migration corridor, protection of the wetlands which serve as habitat and raising public awareness. The Siberian crane is considered to be an ‘Umbrella species’. A species is said to be an umbrella species when its habitat requirements are broad enough to include an entire ecosystem. Thus, protecting an umbrella species would require protection of its complete habitat, which in turn would provide conservation and protection benefits to all other species thriving on and around that habitat. In the case of Siberian cranes, the migratory routes followed by their different populations are also used by a number of other migratory birds which also include 32 endangered species. Thus, conserving and protecting the Siberian crane would indeed offer conservation services to many other critical species. Besides, this white avian angel is also a symbol of high moral values and good fortune. Therefore, saving this for our future generations will help impart good moral values to our human successors. Ms Meeta Kumari is a nature explorer, who studies natural environments like jungles, forests, mountains, deserts, beaches, etc. She is interested in raising awareness about various issues of birds through her articles.